The document was drawn up while Iain Duncan Smith was in charge of the Department for Work and Pensions. It’s interesting that a spokesperson for the Department for Work and Pensions insisted these proposals were never taken forward as actual policies. You see, when This Writer was asked to help a neighbour appeal against an adverse Employment and Support Allowance decision last year, the letter from the Department for Work and Pensions stipulated very clearly that she had just three months in which to lodge an appeal – unless she could show special reasons for delaying. This official letter from the DWP very clearly contradicts the spokesperson’s claim. What else is being slipped into DWP rules behind our backs? An internal Department for Work and Pensions (DWP) paper shows the Government also considered stopping people’s benefits altogether pending the outcome of an appeal. Other plans drawn up by the DWP included slashing appeal times from 12 months to just three, and narrowing the scope of appeal tribunals so that fewer are successful. The proposals are laid bare in a secret DWP document drawn up last year titled ‘Appeals Strategy – post-election planning 2015’. The document appears to have been a response to the huge number of adverse benefit decisions which are overturned on appeal. 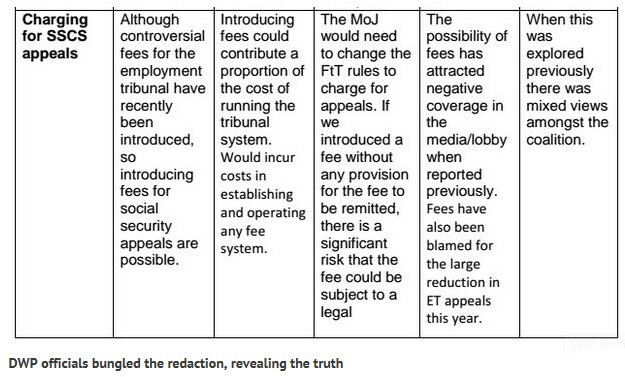 The DWP tried to stop the report being made public – but bungling officials failed to properly redact its contents. That document looks to me very much like hard evidence of a conspiracy to pervert the course of justice. Has anyone reported the DWP to the police for that, I wonder? After all, the conspiracy does not have to be successful to be a crime – simply planning it is the offence, isn’t it? It’s all about privatising the cost if they can’t privatise the service, isn’t it? A DWP spokeswoman insisted the proposals were not taken forward by the Government as actual policies. “These ideas were drafted by staff before the last election. They do not represent Government policy and have never been sent to Ministers,” she said. Mike are they going ahead with this plan? They say no, so we should all probably expect it to be announced this time next year. This will happen, just you watch, the tories would’ve loved this idea, the sick fraks!